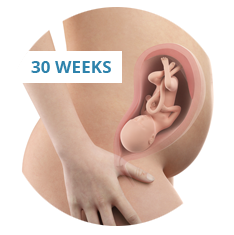 You’re almost midway through your second trimester, which is also the halfway point of your whole pregnancy. 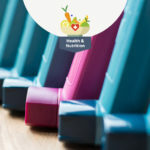 As you approach this major milestone, your baby is growing (as are you), and while it might be tempting to just put your feet up, drink tea and eat biscuits for the next 20 weeks, you really should be making the effort to stay active with some low-to-moderate exercise, at least a few times a week. If the thought of going to a fitness class at your local gym/swimming pool, makes you go hot and cold all over, you could start doing some exercises at home. One of the best and safest ways to exercise in your home is with the use of an exercise ball (also known as a fitness ball, a Swiss ball, a stability ball, birthing ball, or a yoga ball). Offering a low-intensity, comfortable, and fun workout, an exercise ball is a great choice for a relaxed workout a few times a week. 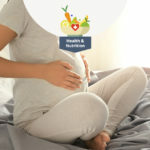 Before doing any form of antenatal exercise, however, whether part of a class or in your own living room, you need to receive the go-ahead from your doctor or midwife. They can help inform you about which exercises are best for you. 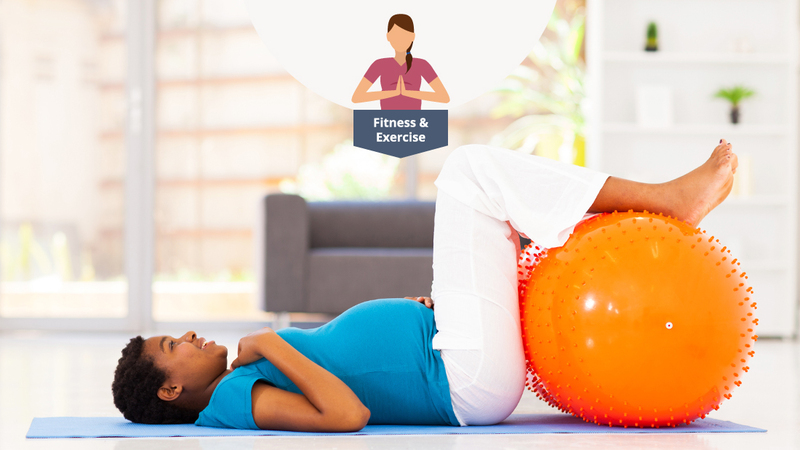 As your pregnancy belly is getting bigger and bigger, a fitness ball will be able to give you the support you need for the extra weight. It will help you work your important abdominal muscles while not putting pressure on your pelvis and back. If you’re using it as an aid for yoga, it can help with your balance as you attempt more challenging positions. Later on, there are exercises that can be used to induce labour (but let’s cross that bridge when we come to it). You can also use your ball just to sit on, as it may be easier for you to get on and off it than a chair or sofa. The best part is that you can work your abdominal muscles and improve core strength even when you’re just sitting. This is because you’re constantly using these muscles to stabilise yourself on the ball. If you’re below 5′, choose a ball with a 45cm diameter. If you’re between 5′ and 5’5″, choose a ball with a 55cm diameter. If you’re between 5’5″ and 5’11”, choose a ball with a 65cm diameter. If you’re taller than 5’11”, choose a ball with a 75cm diameter. Different balls can also support different weights. They should all be labelled with a weight limit. The safest bet is to choose the one that can withstand the most (which will probably be about 300lbs, although some only support up to 250lbs). It’s important that you choose one that is classed as anti-burst. Keep in mind that “anti-burst” does not mean that the ball is impervious to being punctured. It does mean, however, that if the ball does get punctured, it will deflate slowly and safely and won’t pop like a balloon, possibly causing you to fall and injure yourself. But even with a ball that’s going to deflate slowly, you obviously want to avoid a puncture, so make you keep it away from sharp objects; remember to scan your floor for the likes of safety pins and scissors before you exercise. And, lastly, exercise balls and sharp clawed pets don’t mix. Also, you will have to inflate the ball before you can use it, and some balls won’t always come with a pump. So remember to add one to your shopping list (you may find that inflating it becomes a workout in itself) and it might be best to get a partner or friend to do it for you. What are some of the best pregnancy exercises using an giant ball? If you’ve never used a fitness ball before, you may need to take some time to find your balance on it. Go slowly as you lower yourself onto the ball for the first time. Have something (or someone) stable to hold onto if you think you might be a bit too wobbly to start off with. Remember to start with warm-up rotations so that you get used to using the ball and how to balance yourself on it. Warm-up rotations – To help you get used to balancing on the ball, gently rock your hips from side to side. Then try rotating your hips, alternating the direction between clockwise and anti-clockwise. Wall squat – Stand with the ball placed between your back and a wall. Push against the ball as you bend your knees and lower yourself into the squat position. The ball will roll down the wall with you. Straighten your legs to return to the starting position. Repeat for a few repetitions, take a rest and then do another set. 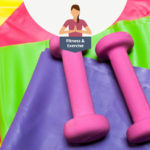 Pelvic floor exercises – A fitness ball gives great support for when you do your pelvic floor exercises (also called Kegel exercises), which are an essential component of any pregnancy workout routine. While sitting on the ball, simply contract your pelvic muscles (as you would to stop the flow of urine) hold it for a few seconds, and then release and repeat. Try not to hold your breath as you do the contraction. Instead, focus on exhaling as you tighten the muscles. 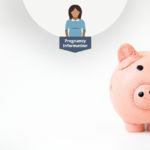 Pregnant push up – A typical push up during pregnancy could be quite dangerous, but using an exercise ball you can complete a set of standing push ups more safely. Press your ball at arm’s length against a wall. Keep your body straight with feet firmly on the floor, slowly press your chest into ball while bending your elbows. The slowly reverse the press action until you are back upright. Repeat for a few repetitions, rest and then do another set. As with all pregnancy exercise routines, start slow and build up. Don’t try to overdo the number of times you complete an exercise and stop immediately if you feel any sharp pain or you feel dizzy or faint. As always, be cautious of your balance. 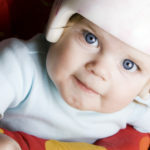 Your baby is well protected, but you need to avoid falls. Don’t try a move if you feel unstable. If you’ve chosen to use free weights while sitting on the ball (with your doctor’s permission, of course), make sure your balance is stable and keep both feet firmly on the ground. 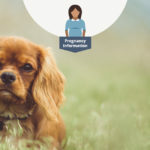 There are some extra issues to be aware of now that you’re well into your second trimester. For instance, you may now be experiencing Braxton Hicks contractions; these are the muscles of your uterus tightening in preparation for labour. 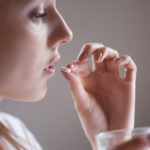 They are infrequent, irregular, and mostly painless, and they are usually nothing to worry about. However, Braxton Hicks contractions can be very unsettling because they can often be mistaken for actual contractions. It’s important that you know how to tell the Braxton Hicks and labour contractions apart so that you know when to act. 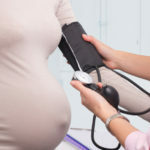 According to eMedicine, there are key differences to differentiate Braxton Hicks contractions from those associated with labour. Birthing contractions happen at an increased frequency, last longer and are more intense than Braxton Hicks contractions. Exercise may trigger Braxton Hicks contractions. If you’re doing fitness ball exercises (or any other physical activity) and find that contractions are causing you discomfort and won’t stop, then slow down and take a quick breather. If the contractions are painful, you should contact your doctor or midwife immediately.